While looking around for the origins of the Rice flag, I accidentally turned up another flag drawing by Cram, Goodhue and Ferguson, the architects of the early campus. 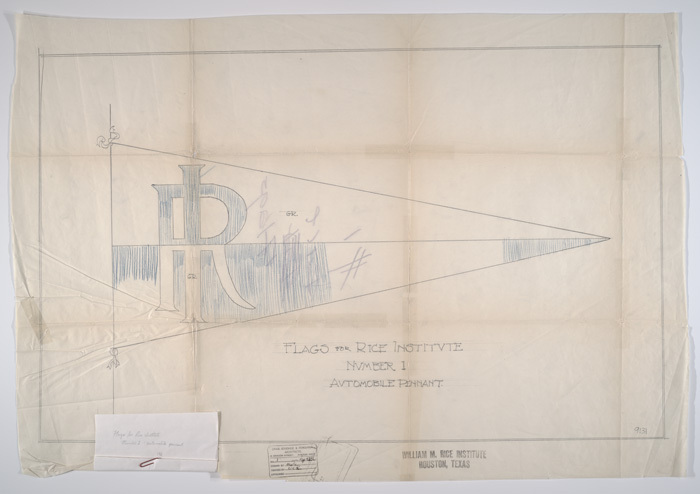 This one is for a Rice Institute “automobile pennant.” It’s a really nice looking design and they certainly were produced in pretty fair numbers. You can see them sometimes in old photographs of the inside of dorm rooms and it was common for students to paste small ones in their scrapbooks. I think we even have a couple of them in the Woodson somewhere. Two things are kind of striking about this. First, the care that was taken with such a small thing is remarkable. Second, there really weren’t all that many automobiles in Houston when this was drawn in 1912. I can’t really draw any conclusions from this. Sometimes it’s just for fun.